Imagine living in a country where taking a drink of water could lead to your execution. 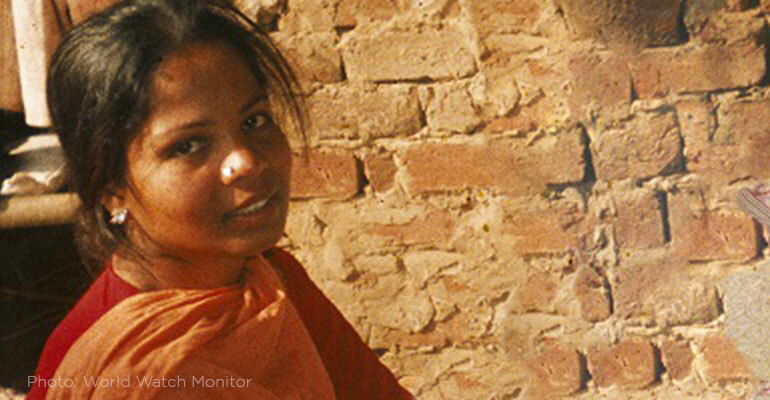 That was the real-life nightmare of Asia Bibi, a Christian mother in Pakistan who, on a hot day in 2009, went in search of water on the farm where she worked. The other women refused to drink from the container, because Bibi isn't Muslim. That started an argument, and farmworkers insisted later that Bibi had made derogatory comments about Mohammed. They accused her of one of the worst crimes possible -- blasphemy -- and she was tried, convicted, and sentenced to death. International groups like Open Doors USA have been raising her case for years. Now, almost a full decade later, after languishing in a Pakistani prison, the mom of five got the news she never expected. The country's highest court is setting her free. Without any evidence supporting the accusers' case, the judges agreed, "The appeal is allowed. She has been acquitted. The judgement of high court as well as trial court is reversed. Her conviction is set aside," Chief Justice Mian Saqib Nisar ruled. It was an extremely courageous decision, especially for judges in an Islamic country. Tensions in Pakistan have been at a boiling point during Bibi's appeal, with hundreds of protestors spilling into the streets when the verdict was announced. Niser and his two fellow judges "have now been threatened with death themselves by one hardline Islamic party, and protests with burning tires have already started," the BBC reported. Local extremists blocked key roads and held signs that read "Hang Asia Bibi." The situation is so volatile that the private schools in Pakistan are all closed for security reasons. According to World Watch Monitor, "One Islamic party, Tehreek-e-Labaik Pakistan (TLP), had warned that 'if there is any attempt to hand her [Bibi] over to a foreign country, there will be terrible consequences.' The party is known for its strong support of the strict blasphemy laws, and has called for blasphemers against Islam to be put to death and for those who kill alleged blasphemers to be celebrated. In February 2016, Pakistani authorities hanged Mumtaz Qadri, the bodyguard who tried to justify his murder of Salman Taseer partly because of Taseer's support of Asia Bibi." Most global watch groups are concerned that even though Asia is free, her safety is very much in jeopardy. But for Bibi, who wasn't in the courtroom when her fate was decided, told media outlets by phone from prison that she was beside herself with relief. "I can't believe what I am hearing, will I go out now? Will they let me out, really? I just don't know what to say, I am very happy, I can't believe it." Her husband, Ashiq Masih, who was left to care for their children, was overjoyed. "I am very happy. My children are very happy. We are grateful to God. We are grateful to the judges for giving us justice. We knew that she is innocent." For now, the goal is getting Bibi out of the country before she's killed by extremists. In the meantime, Pakistan Prime Minister Imran Khan is doing his best to calm the storm. "Saying that these justices are worthy to be put to death and then even going further, that the Chief of the Army Staff is not Muslim and generals should revolt against him, is unimaginable," he said. As FRC's Travis Weber wrote, "This sad saga reminds us of the clear threat posed to religious freedom by the abuse of blasphemy laws. These laws -- which infringe on a proper conception of religious freedom -- would be bad enough on their face. Yet quite often, they aren't even used for their ostensible purpose, but become vehicles to settle personal disagreements and even political scores." While we celebrate the result in Bibi's case, it's obvious that a lot of work remains. "The reaction of much of Pakistani society," Travis points out, "with hardline Muslims defying the ruling -- highlights the need to work on cultural acceptance for religious freedom as much as legal."